The Dash 8, of high wing monoplane configuration powered with two P&W 120s, was announced by de Havilland Canada in 1979 as a complement to the larger four engined STOL capable Dash 7. The company's first transport not optimised for short take-off and landing. The go-ahead to cut metal was announced in September 1980 and the prototype Dash 8 series 100 rolled out in Downsview, Ontario, in April 1983. 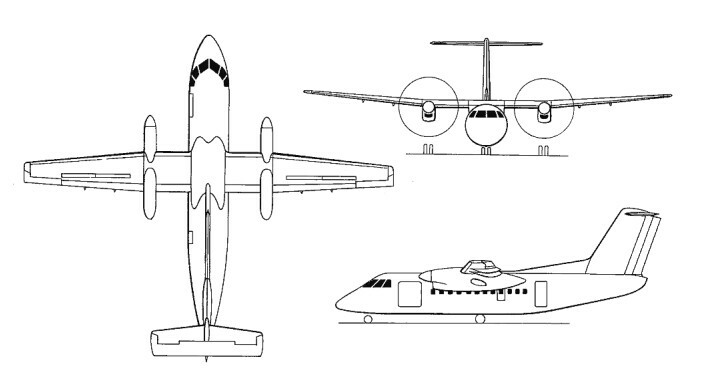 The fuselage cargo-loading door is standard, and other features include a retractable tricycle landing gear with twin-wheel units, large-span T-tail, and a high-mounted wing carrying two fuel-efficient Pratt & Whitney PW120 advanced turboprop engines driving large-diameter slow-turning four-bladed propellers (originally the PT7A) ensuring very low noise levels. These engines also have safety features which ensure that if one fails the other automatically increases its output to 1492kW. The prototype of the 36-seat Series 100 flew for the first time on 20 June 1983. Canadian certification followed on 28 September 1984. The first customer was to be norOntair of Canada on 23 October 1984. Orders for the initial 100 series production version had reached 230 by 1990. The -100A series followed in 1990. The -100A model had a revised interior with more headroom and enhanced PWI20A engines and in 1992 was offered with the more powerful PW121 engines. In 1992 the production switched to the Dash 8-200 and the first deliveries began in April 1995. The Dash 8-200 has PW123C engines, which gave the -200 series an increase in top speed of 30 knots over the 100 series. The -200B series has the PW123Bs for better ‘hot and high” performance. From April 1996 all Dash 8 aircraft delivered were fitted with a computer-controlled noise and vibration suppression system (NVS). To reflect this the name was changed to Dash 8Q (for “quiet”). In 1998 this was changed again to Dash 8-Q200 when the new interior was introduced. The Dash 8-Q200 holds 37 passengers. Boeing, within a month of purchasing DHC, signalled their commitment to the enterprise by announcing mid-1985 the development of a stretched 50/56 passenger Dash 8-Series 300 for a first flight on 15 May 1987 (modified Series 100 prototype). This became the -300 series and the first aircraft was an earlier prototype Dash 8 converted to the new length of 25.68 metres. It first flew on 15 May 1987. Canadian certification followed on 15 February 1989 and the first deliveries were to Time Air later on 27 February 1989, FAA type approval on 8 Tune 1989. The stretch for the series -300 was effected with a “plug,” forward and aft of the wing. of 3.43 metres. The wings also have a greater span of 27.43 metres over 25.91 metres. Other smaller changes were a larger toilet, a repositioned galley and a new galley door, an additional wardrobe, dual air conditioning packs and the option for an APU. Orders for the Srs 300 were in excess of 100 by 1990, deliveries starting in February 1989. The Dash 8-300 provides a very good single engine performance, being able to climb to 14,000 feet at maximum all up weight or descend to 16,000 feet on one engine. Further variants of the 300 series were offered with the first, the -300A, being in 1990 with increased higher gross weights, interior improvements and the stand-ard PW123A engines. The -300B was introduced in 1992 with PW123B engines as standard. All Dash 8-300 aircraft built since April 1996 have also been fitted with NVS and in Throughout the '90s Boeing Canada worked on variants for both military and civil applications. Two transport versions are in service with the Canadian Department of National Defence as CC-142s and four navigation trainers are on order as CT-142. The USAF has two on inventory as E-9As for range control on the Gulf Missile Test range. 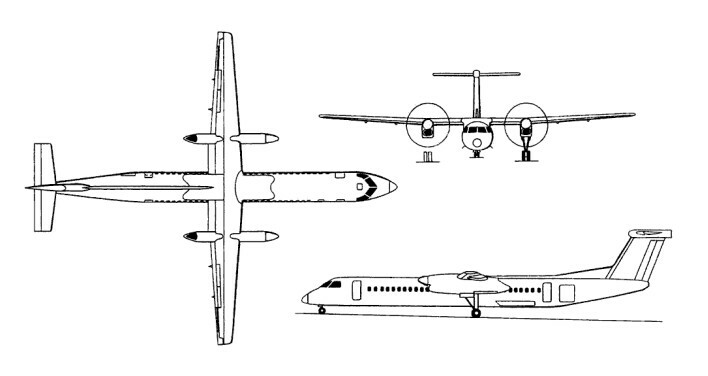 In 1986 de Havilland Canada, by then part of Bombardier, started development of a larger 50-seat regional airliner. 1998 the aircraft where renamed Dash 8Q-300s when the new interior was introduced. Six twin-turboprop Dash 8s ordered by the Canadian Armed Forces have long-range fuel tanks, rough-field landing gear, strengthened floors, and other equipment changes. Designated Dash 8Ms by DHC, four will be used as navigation trainers, while the other two will be allocated to transport duties in Europe, replacing Dash 7s. The 1987 commercial variant was the stretched 50-56-seat Series 300. Launched in June 1995 as stretch of Series 300, the -Q400, can hold 70 passengers, equipped with a computer-controlled noise and vibration suppression system, indicated by the “Q” (standing for quiet) before the model/number designator. First flown on 31 January 1998, FAA FAR Pt 25 approval was received on 8 February 2000. First delivery was to SAS Commuter 20 January 2000, followed by service entry 7 February on the Copenhagen, Denmark, to Poznan, Poland route. The low-noise Dash 8 Q became the standard version from 1996. The 37-seat Dash 8 Series 200 and 50-seat Series 300 turboprops were being produced at the rate of two per month in 1998. By January 1991 the Dash 8 order book stood at 361 aircraft, comprising 251 Series 100s and 110 Series 300s, with around 230 delivered. . A Q300 delivered to Air Nippon on 6 March 2001 was the 600th Dash 8. CC-142: designation of two Series 100s bought by the Canadian. Department of National Defence but operated since March 1987 by the Canadian Forces at Lahr, Germany. Used as passenger/cargo transports, the aircraft are equipped with long-range fuel tanks, rough field landing gear,, high strength floors and a special-mission-related avionics fit. CT-142: designation of four Series 100s, acquired by the Canadian DND, and operated as specially configured navigation trainers by the Canadian Forces. Otherwise equipped similarly to the CC-142, the trainers are distinguished by their extended noses. Dash 8M-100: two specially-equipped Series 100s used by the Canadian Department of Transport to calibrate ILS, VOR and MLS systems at Canadian airports. Dash 8M-300ASW Triton: designation of a proposed maritime patrol or anti-submarine warfare version of the Series 300 equipped with Harpoon or Exocet-type anti-shipping missiles mounted on lower side fuselage sponson hardpoints, and four underwing pylons, outboard of the engines, capable of carrying missiles, torpedoes, mines, sonobuoys or searchlights. With a full range of ASW sensors including FLIR, MAD and search radar operated by a six-man crew, maximum endurance is over 11 hours. E-9A: designation of two standard Series 100 aircraft acquired by the US Air Force in 1985 as airborne platforms to perform telemetry and data link duties in connection with drone and missile testing at Tyndall AFB, Florida. Modified by the Sierra Research division of LTV, the E-9A carries a large fuselage fairing containing a steerable phased-array antenna, underfuselage search radar and special avionics. Both aircraft were delivered in 1988. Engines: 2 x Pratt & Whitney of Canada PW123 turboprops, 2,380-shp. Props: four bladed Hamilton Standard 14SF-23. Initial ROC: 1800 ft/ min. Fuel flow @ 92%: 360 kg/hr each.